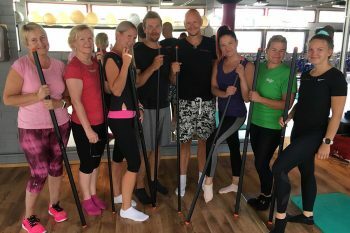 The Mobility Group Training concept is built around the Mobility Training Stick where the stick guides your movements and counts how many times you lose balance during the lesson. 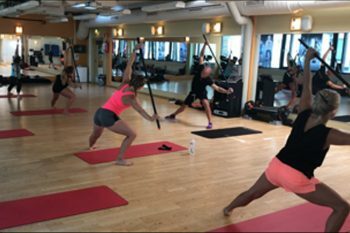 This providese a unique way for you to learn about your own mobility limitations and maintain focus during the lesson. The lessons include low-level exercises. However, they still raise your heart rate, and efficiency is guaranteed because yous are not allowed to take the easiest way anymore. The lesson activates your whole body, but you can especially feel it in ​​the buttocks area and the middle body. Workouts last either 30 or 45 minutes. One lesson includes three different sections: Warm-Up, Rotation/Bending and Cool-Down. This section includes exercises which improve your body balance. The Mobility Training Stick will help you find the right body position in every movement. This section includes exercises which increase your mobility in rotation and bending movements. The Mobility Training Stick will help you to set a goals that you should reach in each movement. This section includes exercises which will increase your core power. The Mobility Training Stick will help you activate the right muscles at the right time.